The Shiga Theatre for Cultural and Industrial Development is located in northern Shiga, a picturesque area set against the Ibuki Mountains that is traversed by two Lake Biwa tributaries, the Ane and Takatoki rivers. It has long been an important economic hub between the Kyoto-Osaka-Kobe, Nagoya, and Hokuriku regions. Consequently, the area is a storehouse for many historical treasures dating to the Warring States period, such as Nagahama Castle, the Odani Ruins, Hogonji on Chikubu Island, and the eleven-headed Kannon of Doganji. The Shiga Theatre for Cultural and Industrial Development was established in 1988 to help rejuvenate the northeast region of Shiga through cultural and industrial exchange. Since opening, it has been operating under the commission of the prefecture to provide first class multipurpose event facilities and performance stages to the public. We work closely with professional producers and artists to create works with themes related to Shiga and promote the attractions of the “Lake Country” both inside and outside the prefecture. At the same time, we help educate people in supporting local art. It is our goal to make culture and the arts accessible to all. As such, we plan projects promoting firsthand interaction with culture and the arts in areas where such opportunities may be limited, as well as provide culture and art related support to communities and schools. We work with numerous groups and organizations to create programs that rekindle interest in the beauty of traditional local culture and industry. In this manner, we serve as a bridge for the creation of new communities and the revitalization of local culture. We approach organizations to participate in industrial events in our multipurpose hall and create programs that take advantage of the natural beauty of Lake Biwa and other tourist attractions in Shiga. Recognizing and seeking to realize the “added value” of culture and art in manufacturing, we also try to support local industry by arranging meetings between artists, craftsman, and entrepreneurs. Northern Shiga is mentioned throughout the annals of Japanese history. Culturally and economically, it was one of the most important areas in the country through the late-middle ages. Accordingly, Azuchi, Nagahama, Hikone, Maibara, and Chikubu Island are featured prominently in many Warring States picture scrolls, and Shiga is today home to one of the largest collections of tangible and intangible Cultural Properties in Japan. Traditional performance art, which is featured prominently in religious festivals and in Hikiyama kabuki theater, has flourished in the area. Various delicate and high quality folk crafts have flourished as well. The kotos and other stringed instruments that have been, and continue to be, produced in Nagahama are particularly fine examples of this. These instruments are used and loved by many practitioners of traditional Japanese music. As a facility born from the marriage of these regional features, we endeavor to provide professional artistic productions, discover and nurture promising young artists in their twenties and thirties, and assist the formation of professional-caliber traditional Japanese music and dance groups. Additionally, we seek to facilitate the re-evaluation of centuries-old traditional performance arts, introduce these arts to new audiences, and create proud supporters of northern Shiga’s culture. We hope to create opportunities for students of local performance arts to share their work, impart the splendor of classical performance arts to children, re-instill long-lost traditional Japanese sensibilities, and provide an environment to where one can become familiar with the laws of etiquette and Japanese culture. The Event Hall features a stage 17 meters wide, 8 meters deep, and 7 meters tall. When the 720 electronically controlled seats and 840 mobile seats are stored, the 1,400 square meter seating area can be repurposed for a variety of uses. Ideal for concerts, large events, and exhibitions. The Small Theater features a stage 9 meters wide, 5.4 meters deep, and 5 meters tall. Available to the general public for theatrical performances, recitals, assemblies, and educational workshops. Family seating (4 seats) is located in the rear of the hall. Parents are welcome to bring their children. Rehearsal studios and multipurpose meeting rooms for workshops, lectures, and seminars are also available. A versatile theater suitable for many types of performances. 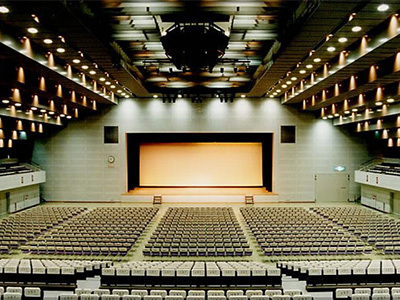 This hall is the largest-capacity event hall in Shiga. Seats a maximum of 1,962 (over 1,400 m²). These rooms can be used for the rehearsal of various performance arts. These meeting rooms can be used for training seminars, lectures, or a variety of other uses. The Shiga Theatre for Cultural and Industrial Development is located 5 minutes on foot from the West Exit of Maibara station (JR Shinkansen/Biwako Line/Tokaido Line/Hokuriku Line). The Shiga Theatre for Cultural and Industrial Development is located 10 minutes from the Hokuriku Expressway’s Maibara Interchange, or 15 minutes from the Meishin Expressway’s Hikone Interchange. Copyright © Shiga Theatre for Cultural and Industrial Development. All rights reserved.